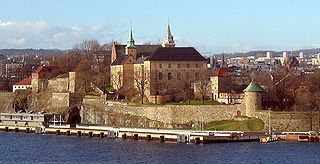 Akershus Fortress or Akershus Castle is a medieval castle that was built to protect Oslo, the capital of Norway. The fortress has never successfully been besieged by a foreign enemy. This article uses material from the Wikipedia article "Akershus Fortress", which is released under the Creative Commons Attribution-Share-Alike 3.0 License.